VLC Direct Pro Free can be awesome, as it allows remote control of VLC and streaming content on both directions. But even while millions of users have not problems at all using the app on a daily basis, there's a small percentage of users that experience connection and streaming problems. In this section you will find the most common problems experienced by users with the corresponding explanation and solution. I see a message saying "VLC Connection missing. Go to menu->settings->Connection to VLC Media Player". What should I do? I followed the guide for connecting VLC Direct with VLC Player and still can't connect. What can I do? If you don't find a solution to your problem here, please contact us: qdevplus@gmail.com or post your question in this blog. You will be answered by the official VLC Direct Pro Free development team. What to do when VLC Direct can't find VLC Player? First of all start your VLC and enable its web interface. If you have windows, we recommend you to use the VLCDIRECT.BAT script to start VLC ready receive connections. If not, you can check out this LINK to know how to start VLC with the proper parameters. VLC hasn't its web interface properly enabled. You can check what happens when you enable the web interface this way: Restart VLC manually (don't use VLCDIRECT.BAT script), then in VLC, go to tools->messages, set verbosity level at 2, and with the messages window open, enable the web interface. If web interface is properly enabled you must see something like "listening to port xxxx"
You have port 8080 used by another application. In that case, VLC used to listen to port 8081; if 8081 is used, it tries with 8082, and so on. You can check which port is VLC using in the messages window: in VLC, go to tools->messages, set verbosity level at 2, and with the messages window open, enable the web interface. You must see something like "listening to port xxxx" where xxxx is the port to used by VLC. Then try tests 2 and 3 using xxxx instead of 8080. If tests 2 and 3 work with xxxx port, then in VLC Direct go to menu->settings->manual configuration and set the VLC Web Interface Port to xxxx. Then do an Automatic Connection Wizard and it should detect VLC. Your PC firewall is blocking remote connections. Disable your firewall or add a rule to allow your phone/tablet to access the port 8080. If this test doesn't return a XML response it can mean two things: first, your PC firewall might be blocking the connection, try disabling it. Second, your phone can't access the PC/Mac; are both the device and the PC connected to the same router? are both in the same LAN? If these 3 tests return a XML response, then VLC Direct will be able to find and connect to VLC Player. After selecting "Android" as target and tapping on a video in the third tab, you see a "buffering" message, but after a while there's only a black screen; no image or sound. VLC Player can't transcode the video "on the fly" fast enough. This mainly happens with slow and old PC's. 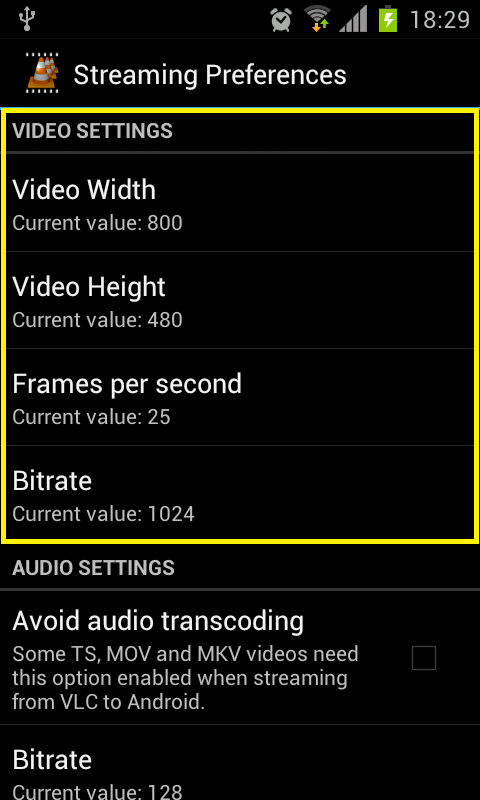 In this case decreasing video size (i.e to 320x240), video bitrate (i.e. to 256) and frames per second (i.e to 15) might solve the problem. All these settings can be found in: VLC Direct->Menu->Settings->Streaming Settings. The Video you are trying to stream can't be transcoded into mp4 (the format supported by android). Even while VLC can transcode almost any video into mp4, there are some exceptions. This mainly happens with corrupted videos or strange formats. To check if this is your problem, download the test files from <HERE> files and try them. Most of android devices have a very annoying bug. 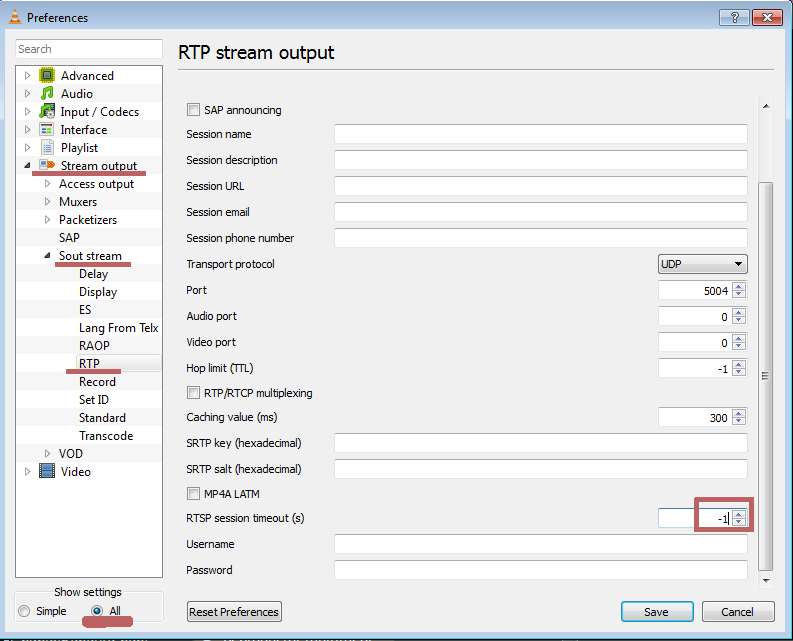 Their internal streaming engine doesn't implement correctly the "KEEP ALIVE" packet of the RTSP procotol. That means VLC server doesn't know that there is an android device receiving the RTSP packets on the otherside and after a defined timeout, the server closes the connection. VLC usually comes with this timeout set at 60 seconds. If your videos stop every 60 seconds, chances are that your device is one of those with the buggy streaming engine. But don't worry; the solution is quite simple! IMPORTANT: This is only needed with VLC 2.0.0 or higher. VLC 1.1.13 and prior don't have this problem. If you are using windows it is highly recommended to use VLCDIRECT.BAT script to start VLC. The script starts VLC with the proper parameters and also enables the web interface automaticaly. don't worry, here you will find the solution for your problem. 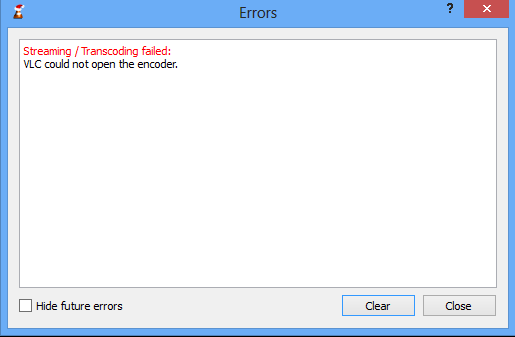 Unfortunately, VLC 2.0 and newer (including al VLC 2.1.x series) has a bug in its audio transcoding codecs. This means you will get sound when playing a video in VLC, but when VLC needs transcode a video to another format and stream it, the audio codec fails. Even while VLC Player in PC/Mac does a terrific job transcoding and streaming videos on the fly, it is not free of bugs. A very ugly bug in VLC 1.x (this doesn't happen with VLC 2.x) makes it crash when you try to stream certain videos. One of the most popular video formats that produce this effect is MKV. Not all MKV produce this effect; only some of them. you just have to go to VLC Direct->menu->settings->streaming settings, and check "Avoid Audio Transcoding"
Anyway, if you want to be free of this kind of problem we recommend you updating your VLC to 2.1.x series. Those versions don't present this MKV transcoding problem at all. 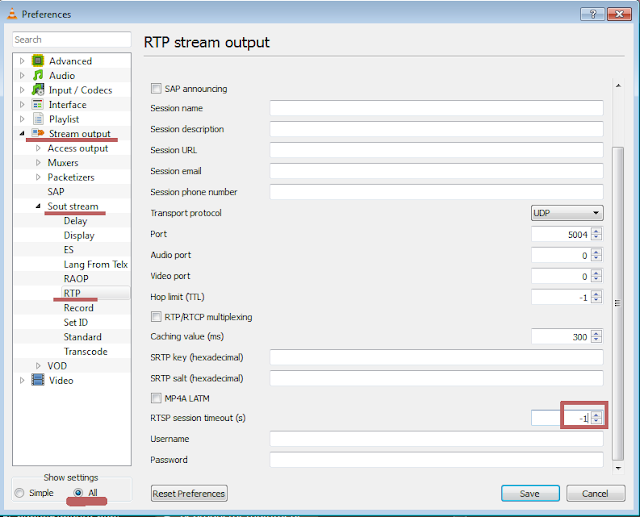 Because of this, VLC Direct allows users to adjust every streaming parameter to fit any specific need. 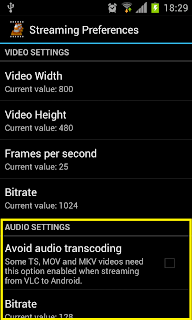 There you will find two important sections: Video Settings and Audio Settings. Please keep in mind this: Every improvement in video and/or audio quality will require more network bandwidth, and every decrease in bandwidth requirement will affect the video and/or audio quality. So the idea here is to find a balance between quality and network bandwidth requirement to fit your needs. VLC Direct Pro Free has, within its features, support for SRT and SUB subtitle formats. You can even have more than one subtitle file for each video file and the app will ask you which subtitle should be used. 1. The video file and the subtitles file must be in the same folder in the PC. Importante notes: The subtitles feature is available when streaming from pc to android, but not when streaming from android to PC. hi, when i install vlc player all other programs open in vlc. 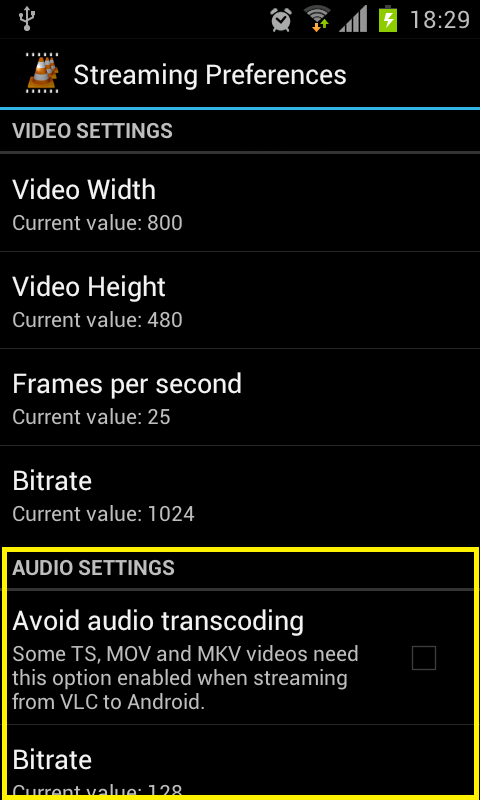 When using target as android and streaming videos from pc to android, we are getting mono sound not stereo. 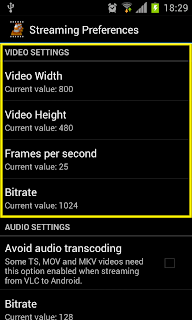 Is there any way to getting stereo sound in my android when streaming pc video to android. currently VLC Direct Pro Free uses 2 channels for audio files (mp3) and 1 channel for most of the video files. In the future VLC Direct Pro Free will allow you to select the number of channels for video streaming. features like "effects and filters" and "track synchronization" aren't working on my vlc.. i had vlc 2.0.3 ..i recently had it uninstalled and installed the fresher edition 2.0.6..but the problem remains there..please somebody help! Hi, that seems to be a VLC Player problem (not related to VLC Direct Pro Free). I Recommend you refering to videolan forums (http://www.videolan.org) . They should be able to help you with this problem. 1. When streaming from my Galaxy s4/Android/ to PC no subtitles are shown on VLC/PC/, although subtitles are named properly on the phone. Please give some advice how to solve these problems. 1. Very sorry for the subtitles. 2. The problem with the sound can`t be solved by changing the bitrate. DLNA protocol allows diret file transfer. S4 should be DLNA, VLC i don't know, media player i think. The router the same it must be. that's strange... anyway, I don't think the problem is VLC Direct Pro Free itself, but I am not sure... please send an email to vlcforandroid@gmail.com; they might be able to help you. Currenly the DVD support quite limited. unfortunately, you have to select individual VOB files. In future this feature will be improved. Hi. I followed directions and used the batch file provided, but audio is still absent when playing w android as the target. Any ideas? Running win 8 and a rooted android 4.1.2 (stock rom w a custom kernel) on an sgs3. Thanks. I am unable to connect to the vlc 2.1 rc2 server with the vlc direct pro free for android client. That's strange... it should work. Can you access the web interface through the web browser from the pc and from the android device? 1. not internet, but at least you need to have both the pc and the android device connected to the same wifi router. 2. you can stream from vlc direct pro free to the laptop, but not from the mobile browser. When I browse my laptops file system through the android app, I am only able of open a few folders - one of the folders I can't open is My Videos... Are there some permissions that need changing? If so, where and how? After I connected my phone vlc to the pc vlc, it says "i can not connect to VLC (my ip address:8080). I've put the password "vlcdirect" into the "lua" on my pc. While streaming pc(Samsung laptop) to Android Galaxy Tab 7.0 no subtitles show, even tho I disabled th "hide non-media files" tab and all files are .srt and named just like movie file on the same folder. Help? Thanks in advance. what is the name of the video file and what is the name of subtitles file? The Disable subtitles option is unchecked. When streaming from a pc (VLC 2.1.2) the video (and subtitles) play on my PC and not on my android device.. Maybe it's a noob question, but what am I doing wrong?? Hi Jasper, you have to toggle the target to "Android". The target is the icon in the upper left corner of the screen. yep, noob question ;-) problem solved, thanks! I have a Samsung Galaxy Tab 3 with Android 4.1.2. It shows a black screen with the internal player but plays fine with an external player. Is this "one of those devices in the ecosystem"? Could you please help me with the issue below? Thanks. main debug: using interface module "lua"
lua error: Error loading script C:\Program Files (x86)\VideoLAN\VLC\lua\intf\http.luac: ...xtras/package/win32/../../../share/lua/intf/http.lua:211: Failed to create HTTPd file. I got the app and program working just fine but when I try to stream an mkv file, VLC just crashes on my PC. I've tried adding your recommended parameters, the VLCDIRECCT.BAT file and the "avoid audio transcoding" option but still VLC crashes when I try to steam mkv files from my PC to android. 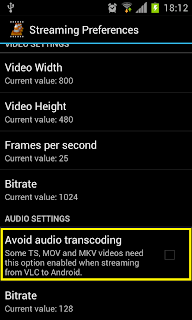 "avoid audio transcoding" is only necessary for VLC 1.1.x; VLC 2.x shouldn't crash with mkv files. What about showing subtitles embedded in the mkv? Please assist... I attempt to play the mp3 files through direct and it tries to run them as video files. I double click the same file on the pc and the vlc runs out flawlessly. Any clues? I am using VLC 2.1.2, with the --sout-avcodec-strict=-2 parameter. Every time I try to stream a MKV VLC will crash on my PC. I have tried this on 2.1.3 and 2.1.4 as well. It happens to every one that I have tried, and the files are perfectly playable without streaming. It also causes a "VLC has crashed" dialogue box to open whenever I start it. Forgot to mention, but VLC will always start with a command prompt after the dialogue is closed. Getting "VLC Found, but the HTTP password is wrong"
however I can log in and get the XML feed from my PC with the password I put. Changing the password makes me re-log, and it is correctly updating. Obviously the phone is finding VLC and connecting to determine the PW is wrong. I get a "failed to find" if I don't have the VLC server running. I've tried 3 different passwords. I can always get in from the web, but never from direct. Always a pw mismatch. Betting the script is inserting a character or changing a case? VLCDIRECT.BAT link broken. Fix it please. Hi John Stepp, Somebody named Jeff asked this before but he didnt come back. I have the same problem: VLC Direct Pro keeps saying the http-passwords dont match, even though they do match. You asked him if he could reach the web-interface with a browser on PC and Android. Jeff didn't answer anymore, but I did try this, and I can reach the webinterface both locally on my Pc and with my Android in the wifi network. I used the links you provided (http://127.... local and http//192... on my android. Both asked for the password, which returned an XML file, so it is working. The password is also the same as in my VLC direct. Sorry, never mind... I changed the password and then changed it again. Seems I have to really make sure VLC Direct is closed properly and then re-open it to make it pick up the new password. hey guys, I have the exact problem as described above, but streaming from my mac to android. how do I do it on the mac? I already tried with automator, but since Im a total noob regarding that, I didn´t have any success. many thanx for any help! I just recently got the app to stream .mkv files from my PC to my android. I noticed every single one has crashed on startup. I'm currently running version 2.1.5. All mkv files work perfectly on PC and from android to PC, but not the other way around! 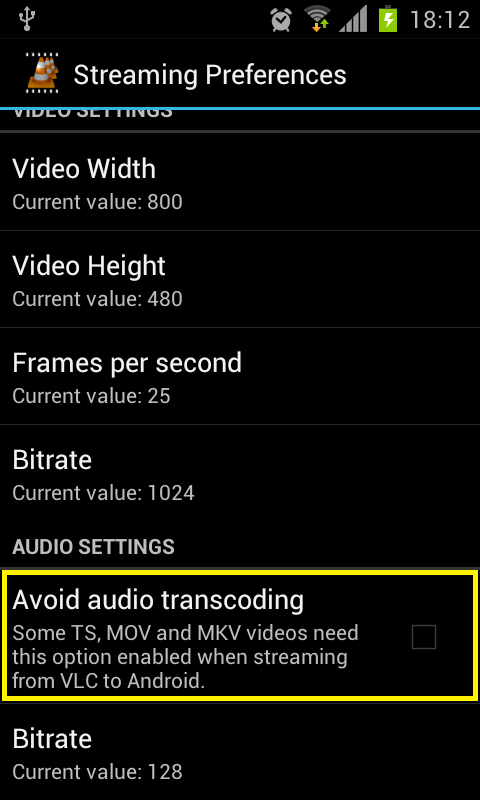 I have also tried using the "avoid audio transcoding" option as well. I would be much obliged if you have any solutions for this. Great information I got here. I've been reading about this topic. I found it here in your blog. I had a great time reading this. After installing your VCLDIRECT.BAT on my windows 8 PC and the VLC Direct app on my Samsung tablet, I run both programs and be able to see films from my PC to my tablet. It works fine. Great job. I stil have a problem with .wpl files. When I select "Target: Android" on my tablet and select a .mp3 located on my PC, I can hear the music on my tablet. But if I select a .wpl file, it plays the music on my PC and not on my tablet. On my tablet, I can only see the black page with big green point to pause/start the music. Can you tell me what I need to do to listen the music of my playlist on my tablet? Any way possible that I can stream live content, NOT recorded, from 'Droid to PC? Am using an app from Google Play but a larger screen would do me fine. Is there a way to use this VLC streaming method to streak to a Roku device? This is a nice post. Thanks for sharing with us. It was enough to upset this problem, but I visited your website and I found your post and today I did learn from this problem. I've installed windows 7 on my laptop after buying license from ODosta Store, I want to activate it to get free upgrade from windows 7 professional to windows 10 home. I'm now confused, How to activate and upgrade to windows 10. Please mention within details. I have vlc for win 10. version 3.0 none of these are working for me.... do I need to downgrade my vlc ? All content in this blog is 100% original and approved by VLC Direct Pro Free development team. Simple theme. Powered by Blogger.